weddings, weddings, all around, from preparation to celebration. I realize I’ve been pretty lax at blogging during the past little while; I blame the fact that so many eventful things have happened in that time. 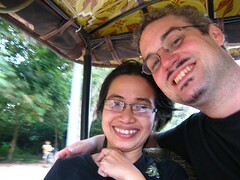 perhaps the most significant of these was my wedding—followers of this blog will remember that Quynh and I got engaged during my first trip to Vietnam; you may even have read the story. In the interest of saving some time while imparting some crucial information, I’ve collected a number of tweets relating to our wedding to share with you all. This installment covers the preparation for the wedding, beginning around December, all the way through to the wedding. Check back for more joyous reminiscing! Written on Feb. 25, 2010. The air here in Da Nang is cool this afternoon, and the shade inside the dusty, cream-coloured offices of the Justice Department is a welcome change from the hot sun outside. I tap my thoughts and reflections out onto an iPhone as I wait for Quynh to finish her interview upstairs. We’re scheduled to be married in just over a week, and this set of interviews is the last legal hurdle to jump for our union to be recognized by the state – at least, besides signing a bunch more documents in triplicate. I went under the scope first, and they brought in a translator to talk with me so they could make sense of my strange moon-language. The questions they asked were… bizarre. What’s her phone number? Her date of birth? Her email address? I guess I was expecting relevant questions, you know, like something besides what you’d put on a credit card application. But in retrospect, remembering what Quynh and I had discussed about the nature of the interview process, these banal questions make sense. They’re apparently intended to weed out arranged marriages, ones brokered through agents– proverbial “mail-order brides”. I guess I always thought of the business of “mail-order marriages” as a big joke. I’d heard of stories regarding the practice and found them to be too unbelievable to be true. How could two people become so desperate– or morally directionless– as to reduce marriage to a mere transaction, to reduce a human being to a mere commodity? When Quynh explained to me that such “agency marriages” were a well-known (though strongly condemned) practice among Vietnamese women, I was filled with incalculable rage, so much so that I nearly fell off a speeding motorbike. it seemed to violate everything I’d ever believed about love, marriage, and human relationships. supposedly the phenomenon is mainly driven by despair, on both sides. Quynh explained to me that many of the prospective husbands– the word “customers” brings my blood to a boil, although most are indeed customers– would be considered “past their prime”, and perhaps feel impotent to attract women in their own country. As a side note, some of Quynh’s neighbours have expressed astonished at how young I look– perhaps expecting her North American husband to be in his 50s. On the prospective bride’s side weighs the burden of percieved “marriageability”, or, in the case of a Vietnamese woman in her late 20s, the steadily dwindling levels thereof. In short, an unmarried woman over 30 years old is widely viewed as a failure. Such a perception isn’t unique to Vietnamese culture, but it’s much more pronounced here. When Quynh and I broadcasted our engagement ceremony over the internet, we neglected to provide an explanation (or translation!) of what was happening, and most people felt a little lost watching the ceremony take place. “What are they doing? They’ve got rings… is this a wedding? I thought it was an engagement.” “There’s a lot of talking, and I can’t understand what they’re saying… when are they married?” To avoid that this time, here’s a brief overview of what we expect to happen during the wedding ceremony, that’ll be broadcast live as it happens, right here on doberman pizza (be sure to find your local time for the event so you don’t miss it—it’ll be 9 PM Eastern Time on March 5th, which is 9 AM on March 6th in Vietnam time). Introduction of the wedding ceremony’s program. Introduction of the two families. A representative from the groom’s family presents gifts to the bride’s family.—These gifts, colloquially referred to as “red boxes”, contain traditional items—such as candles, tea, betel nuts, and so on—given to the bride’s family as a bride price, a long-standing custom in many Asian cultures. A representative from the bride’s family receives and accepts the red boxes.—A running joke during our engagement was that the bride’s family had the option to refuse the gifts, meaning the groom would have to leave and come back another time with better gifts before he could receive his future bride. The groom and bride present their two families. The groom gives the bride the wedding bouquet. Praying for ancestors.—Ancestor worship is a strongly rooted custom in many Asian cultures. In the Vietnamese custom, this includes burning candles and incense, offering fruit and flowers, and displays of veneration and respect such as bowing towards the altar, which is decorated with photos of the deceased. In a Baha’i ceremony, prayers are also offered. The groom offers a prayer and recites the Baha’i wedding vow. The bride and groom exchange wedding rings. An excerpt from the guidance of ‘Abdu’l-Baha on marriage is read. A representative from the groom’s family confirms their acceptance of the bride as their daughter-in-law. A representative from the bride’s family confirms their acceptance of the groom as their son-in-law. The Chairman of the Spiritual Assembly of the Baha’is of H?i Châu, Da Nang, confirms the marriage.—A Baha’i marriage must be accepted as valid by the local Spiritual Assembly. Gifts from the two families, relatives and friends are offered.—Gifts (usually red envelopes) are given to the new couple at this point by those assembled. Either the bride or groom thanks those assembled. Break; the bride’s family gets ready to send the bride off. so you’ve been pondering, and wondering. and you’d really like to hear the whole story. well, here it is (slightly abridged, but here it is nonetheless). Quynh and I met online last year, during Ridvan. The big news at that time was the Vietnamese Baha’i community’s official recognition as a religious community by its national government, a long-awaited event that ushered in a new era of religious freedom for Vietnam’s Baha’is. It was also around this time that I was considering going somewhere in the world to offer international volunteer service. After finding out that Quynh and I had close mutual friends (Craig & Geneviève, who met in Vietnam and now live in Victoriaville), I decided to make the connection, initially to find out more about Vietnam and explore service opportunities. We got along very well from the beginning, and before long, we began talking about the possibility of the two of us getting to know each other better and becoming a couple. From the summer onwards, we began to ask each other lots and lots of questions to help us along in becoming “thoroughly acquainted with the character of the other“. By the winter—after some time of becoming closer to each other through our frequent communications—it became clear to me that the only sensible thing to do was to plan on visiting Vietnam: at once to serve there (hopefully), and to meet Quynh in person. When I inquired with the Baha’i community there, they informed me that their newly-formed Spiritual Assembly required a website, and would I mind coming to work on it? With this positive response from abroad, I checked on whether my work situation would allow it, applied—and received approval—for unpaid leave, and told Quynh I was coming to see her in the spring. After preparing for my trip during the winter months and tying up loose ends at work, I finally arrived in Vietnam (via Japan) on March 31st. Quynh stuck around to introduce me to a hectic and bustling Ho Chi Minh City—a city that needs a lot of introduction. She then continued on to Da Nang to assist the Baha’i youth there while I stayed behind to meet with a task force for management of the website. I joined her in Da Nang a few weeks later, just before the 2nd National Convention on May 1st and 2nd—just about a year after we had first met. We soon continued onwards to Hanoi together, where she was assisting the friends there to establish the foundation for their program of intensive community growth. It was while in Hanoi that we spent the most time talking together about our relationship, in person and on the phone (since we were staying in different houses). These long discussions laid down the path for us to become even closer, and eventually led me to ask for her hand in marriage on June 2nd, while taking a break in—yes that’s right—Hanoi’s Lenin Park. The mystery is solved! On our return to Ho Chi Minh City in early July, we sought the consent of both sets of parents—hers in person, in her flat in Tan Binh District, and mine via Skype to Canada. (God bless Skype and its creators.) 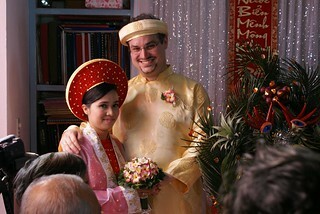 With consent from both parents, we set a date of August 4th for our engagement ceremony, which was held in her parents’ home in Da Nang, according to Vietnamese traditions, red boxes and all. Many of you probably wondered: what gives with all the secrecy? We never heard anything about it until the week before! Well, let’s just say that, after thorough consultation, we decided to keep it a low-profile event, and to announce the coming union after the engagement ceremony—until, of course, the news was leaked on Facebook by an overexcited sister, making the point moot and causing much rejoicing all around. What’s in store for us now? Well, our current plans involve Quynh visiting Canada sometime during the winter (February, the month least hospitable to those hailing from hotter climates, seems most likely), and the both of us returning to Vietnam for the wedding, which will take place in Da Nang in early March, during the first few days of the 19-day Baha’i Fast. We’ll be together around a month after the wedding, after which I’ll be returning to Canada to continue my job while she continues hers—she’s working full-time for the Baha’i Faith in Vietnam until April 2011—and submits her application for a Canadian permanent resident’s visa. The eventual plan is for her to come to Canada—that is, if the Baha’is of Vietnam will allow her to go!